Matzah cover, originally uploaded by Shadrach Meshach & Abednego. This is the bread of affliction which our forefathers ate in the land of Egypt. Let all those who are hungry come and eat with us. Let all those who are in need come and share our meal. Passover begins next week. It celebrates the Exodus from Egypt and is hallmarked by two big ritual dinners, or seders, that feature the communal reading of the Exodus story and eating matzah, or unleavened bread. The story goes that the Jews had to leave Egypt so quickly that they had no time to wait for their bread to rise, and for this reason, we are allowed to eat no leavening for the eight days of Passover. Calling matzah the bread of affliction is another reminder of the slavery that the Jews endured in Egypt, and after eating it for eight days, one certainly feels afflicted! 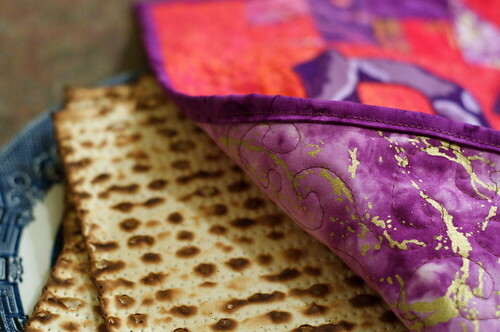 At the seders, the plate of matzah is covered by a cloth until a certain point, at which time they are revealed. 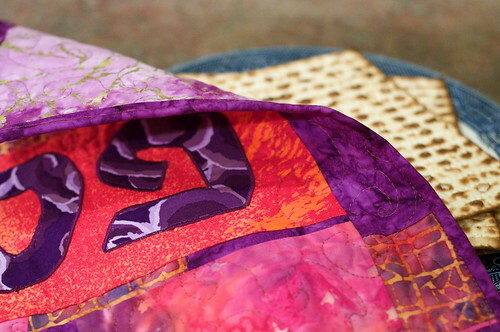 I made this matzah cover as a gift for Susan who is hosting the first seder this year. We will have the second seder at our house on Tuesday night. 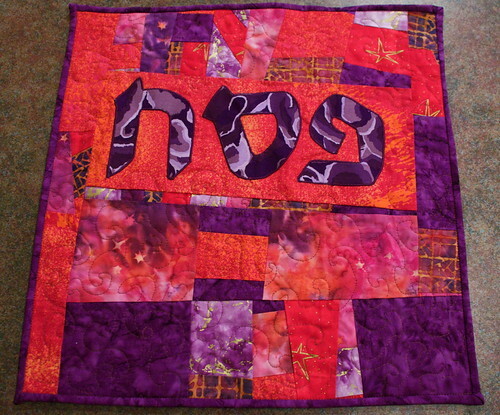 I wanted to make another one for our seder, but ran out of time. I was surprised how quickly and easily it came together. 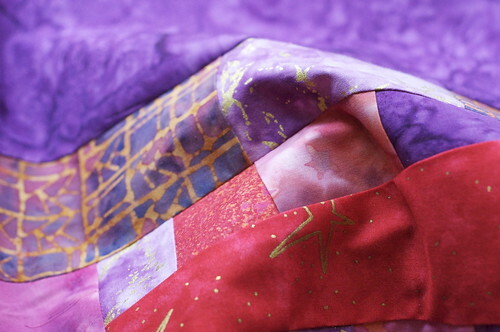 It is mainly batiks, with a bit of regular quilting cotton. The Hebrew letters, which spell Pesach (Passover in Hebrew), are ones I got from the internet, from a Jewish education site showing the Hebrew alphabet. I printed them, photocopied them at 400%, and, using a lightbox, traced them onto fusible webbing. I ironed the webbing onto cotton and cut out the letters, then hand-basted them onto a piece of fabric. Using a narrow zigzag stitch, I machine-appliqued the letters. 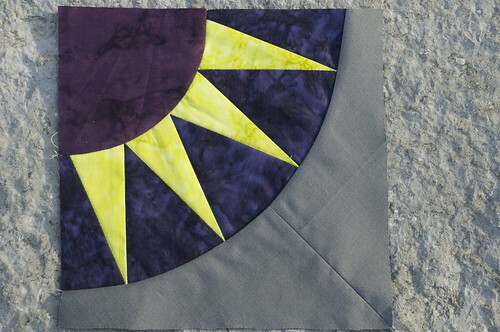 The batting is a piece of cotton flannel, and the backing is another piece of batik - light purple with gold highlights. Between now and Monday night, I have to turn my house over for Passover, taking all regular (non-Passover) food, the toaster and breadmaker, down to the basement and cleaning all the cupboards, shelves and cabinets to remove any trace of leavening, or chametz. A big job, since I'll be in Toronto for the rest of the week! Today I will be deciding my menu for the seder. Whew! I'm going to need some extra coffee before my noon cut-off! If you celebrate Pesach, what is your biggest challenge for getting ready? And what are you making for the seder? 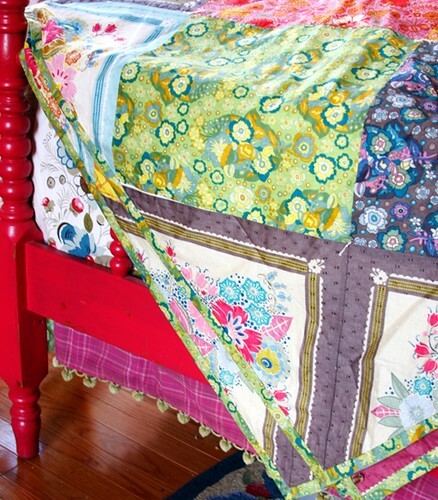 It's National Quilting Day plus First Day of Spring, Y'all! 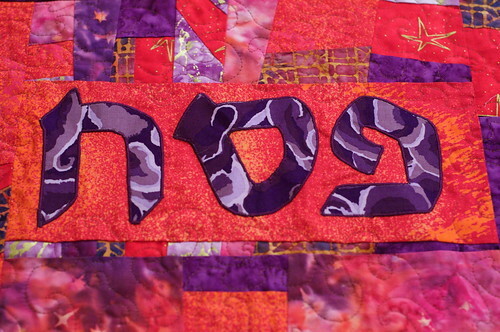 National Quilting Day, originally uploaded by Shadrach Meshach & Abednego. I guess there's a Day for everything, but I'm very happy that today recognizes my favourite creative activity! And how great is it that it also falls on the official first day of spring? I know! Here are a couple of pictures of a WIP that I'm playing around with today. I'm keeping it on the downlow until I decide if it is going to be something worthy of gifting. The jury is still out, but I do love the colours in this little piece. And I am happy to report that I have finished Jennifer's New York Beauty AT LAST. In the end I didn't have the courage to go for Block #1, and stayed at lowly Block #0. I reckoned Jennifer deserved something that had at least a halfway decent chance of turning out like it was supposed to. 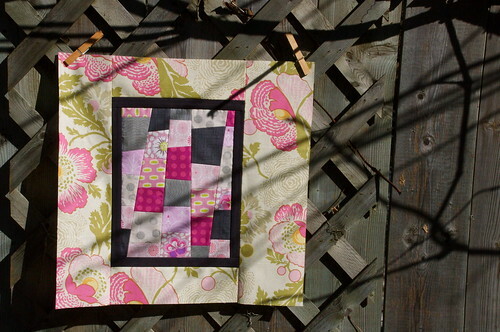 Without a doubt, this NYB has been the biggest challenge to my quilting skills this year. Although, in truth, it wasn't really so hard to make the block once I got started; pushing through all the narishkeit in my head about possibly screwing it up was ridiculously time-consuming. It was a February bee block, folks, and here we are, stepping into Spring. Shameful, isn't it? 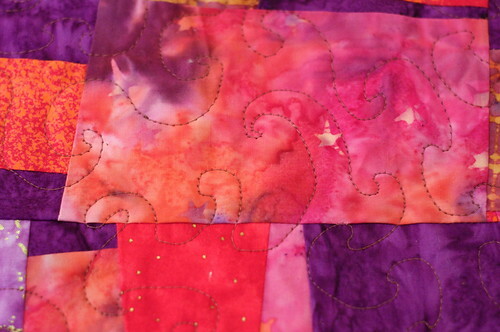 But enough about my sins - what have been your biggest quilting challenges this year? voile.coverlet, originally uploaded by annamariahorner. Look at this stunning and envy-inducing photo from Anna Maria Horner. There is nothing more beautiful than this voile. Can I get a witness? So luscious, so dreamy, the list of superlatives goes on and on. If you love it as I do, let your fingers do the walking over to QuiltHome, where Anna Maria Horner's Little Folks is on 30% discount. 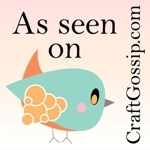 (I am not associated with them in any way - just enabling my friends' fabric addictions!) I have been reading what AMH says about working the voile, and I'm sold. I've been pretty quiet for a week, but not through inactivity. I've been working on something Top Secret and I'll be able to show that to you sometime soon. But I have also been busy trying to clear my slate of February bee blocks. It's terrible to be so dilatory. But I am making progress. 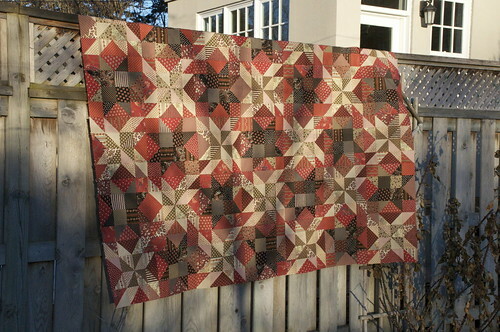 First, here is Marianne's block for the Maple Leaf Quilting Bee. She asked for a block that used a smaller, internal block modeled after Oh, Fransson's Map of the States block and edged in a dark grey. Pretty, no? Second, here is my practice block for Jennifer's New York Beauty. Can words express how terrified I still am of this block? I seriously considered a slug of bourbon before I started this. 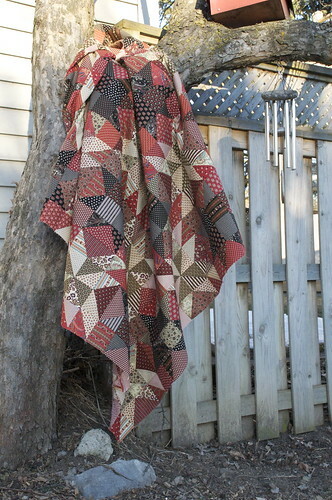 Jennifer sent us a link with many NYB patterns, and the one I made was the beginner block. 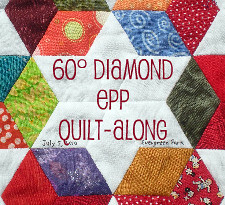 In fact, they numbered all their block patterns and this one is number 0. They must figure that it's so simple that no one would want to make this one, beyond practicing your skills. Ha. Seriously, though, once I got started, it seemed to go fine. I had my usual trouble of cutting my fabric way huge to make sure I cover the pieces properly, but I think I'm getting better with that. And I sewed the curved bits together using NO PINS. I read somewhere that when sewing curves, you only need to worry about lining up the half inch under the presser foot, and the rest of the seam can flop. So I went slowly, made sure I set my machine to stop with the needle down, and used a stiletto to keep the edges together as they went under the presser foot. Afterwards, I clipped the curve in a few places and it pressed flat nicely. Not bad! For a baby beginner block number 0! 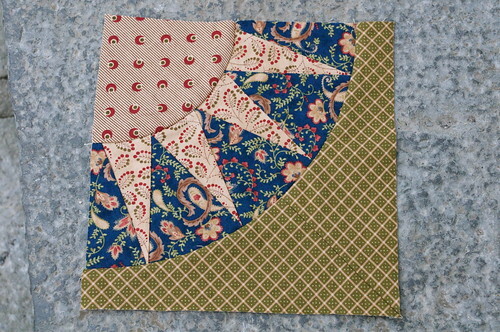 On the strength of this block, which has haunted my dreams for the last month, I am posting in Amy's Sew-n-Tell Friday. Tomorrow, I will replicate this - fingers crossed - with Jennifer's fabric. If I revisit that decision about the bourbon, I may even move up to Block 1. Stay tuned! Now to the topic of today's post - I've signed up for a purple charm chain swap. 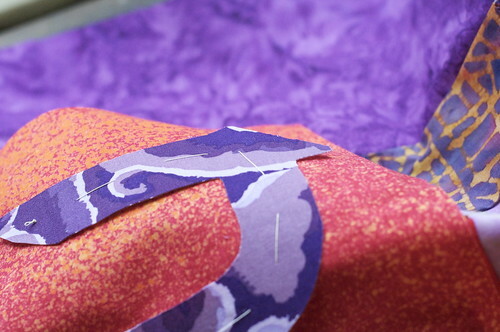 I need five people who want to accumulate 6" charm squares of purple fabric. It is a chain-letter model, in which you receive a list of five names, to whom you send 2 six-inch squares of purple quilting fabric. Then you add your name to the bottom of the list, lop off the top name on the list, and send it on to five others. One ends up with 72 purple charms. Sounds fun? Come on, you know you love purple. Say "yes!" in the comments and I'll contact you - or email me if your profile is set to no-reply. Paprika, originally uploaded by Shadrach Meshach & Abednego. Last night I stayed up until about 12.15, sewing the Paprika blocks together. Then I sat in the armchair with my laptop for a few minutes, checking email before bed. I didn't mean to fall asleep, but I woke up at 1.45, neck permanently cricked, and absolutely frozen, since it was well past the point where the heat turns off for the night. Never mind, the quilt top is assembled! I made it larger than the pattern calls for, so that it can be a proper bed-sized quilt. At 84 x72", it's the biggest quilt I've made yet and I'm a bit nervous about how I'm going to quilt it. I'll worry about that tomorrow! I really love it. The colours aren't precisely spring-like, but I don't care. The reds, blacks, golds and creams are spectacular in this fabric line. I'm so glad I made it! And if you're seeing it for the first time and wanting to make it yourself, it's a pattern in the February 2010 issue of the Fons and Porter quilting mag. And now to add this to the list at Amy's Sew-n-Tell; why not go over there are see what amazing things people have finished up this week! Beauty!, originally uploaded by Shadrach Meshach & Abednego. 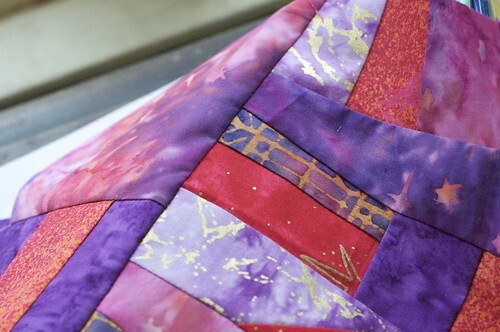 I have no quilting photos to share at the moment, but every blogpost needs a picture, right? 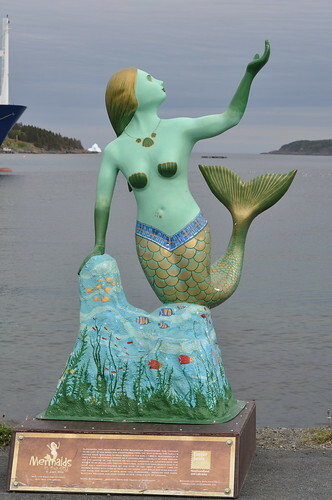 So I thought you might like to see this beautiful mermaid, which I snapped before our whale-watching trip in Witless Bay, Newfoundland last June (no whales spotted, but lots of puffins, which are ADORABLE!). Also of note is the iceberg over her right shoulder. If you click through to Flickr, you can see some closer shots of that chunk of ice. It was pretty impressive! 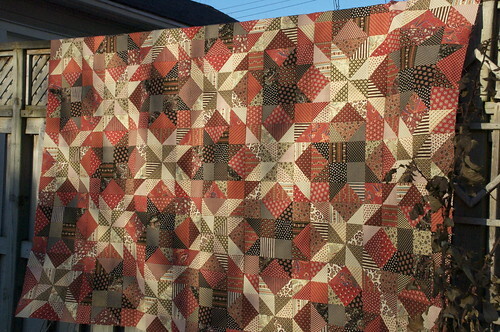 (1) Last night I finished all the blocks for Paprika, that amazing red and black quilt, and - with the blessing - will be putting it together tonight, so that I FINALLY have something to post for Show-n-Tell Friday. So stay tuned! (2) Tonight, my LQS is opening after hours for a sale in honour of the Canadian medal success in the Olympics. We won 26 medals overall, so everything is 26% off for 2.5 hours. I'll be there with bells on! And a list! (3) My recent experiment involving the cessation of coffee consumption after noon has been a resounding success. Of course, correlation is not causation, but I have been sleeping like a baby ever since I took the pledge, as it were. In general, it was not as hard as I would have anticipated to go without caffeine in the afternoon, but there are the odd times that I have the desperate craving. Funnily enough, online fabric shopping makes it go away. Another case of the cure being worse than the illness? Methinks yes!